1گروه مهندسی عمران، واحد تبریز، دانشگاه آزاد اسلامی، تبریز، ایران. 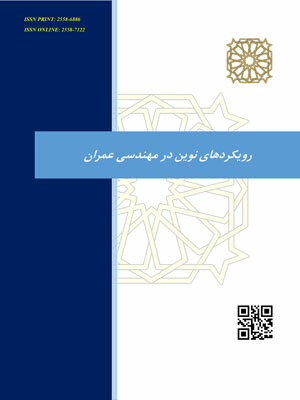 در این تحقیق، تاثیر استفاده از لایه­ های ژئوگرید در تسلیح خاک زیر پی برای مطالعه رفتار پی ماشین آلات صنعتی تحت بارگذاری متناوب به روش عددی اجزای محدود توسط نرم افزار ABAQUS مورد ارزیابی واقع شده و اثر تعداد لایه‌های ژئوگرید، عمق و عرض ژئوگرید، فرکانس‌های بارگذاری متفاوت وتاثیر استفاده از لایه­های ژئوگرید بر روی مقادیر فرکانس مودهای اول تا سوم خاک مورد بررسی قرار گرفته است. نتایج حاصل از تحقیق حاضر نشان می‌دهد که با افزایش تعداد لایه­های ژئوگرید، ظرفیت باربری پی افزایش یافته و عمق بهینه استقرار لایه ژئوگرید برای حالت دینامیکی برابر 0.6 برابر عرض پی نواری می‌باشد. همچنین، با افزایش فرکانس بار دینامیکی تغییر محسوسی در ظرفیت باربری رخ نمی دهد و استفاده از مسلح کننده تاثیر بسیار ناچیزی بر روی فرکانس طبیعی خاک دارد. - Raymound, G. P. and Comos, F. E. (1978). Repeat load testing of a model plane strain footing, Canadian Geotechnical Journal, 15, 90-101. - Poulos, H., Aust, F. and Chua, E. (1986). Bearing capacity on calcareous sand, Research report, University of Sydney. - Yeo, S. C. Yen, Puri, V. K., Das, B. M. and Wright M. A. (1993). A laboratory investigation into the settlement of a foundation on geogrid-reinforced sand due to cyclic load, Geotechnical and Geological Engineering, 11,1-14. - Sarand B.,F., Hajialilue, M. and Katebi, H. (2010). Study of reinforced and unreinforced sandy soil under strip foundation with using P.I.V. method, 4th Conference of Geotechnique and Soil Mechanic, Tehran, Iran. (In Persian). - Gholamhoseinpour, A. and Soltani, F. (2011). Comparison of methods of determining bearing capacity of foundation under rock, 1st International Conference and 3rd National Conference of Dam and planets, Tehran, Iran. (In Persian). - Nazari, R. and Dabiri, R. (2016). Comparison of geotextile layers effects on static and dynamic behavior of pavement, Journal of Structural Engineering and Geotechnique, 6(1), 15-22. - Binquet, J., Lee, K. L. (1975). Bearing capacity of analysis on reinforced earth slabs, Journal of Geotechnical Division, ASCE, 101, 1257-1276. - Wayne, M. H., Han, J. and Akins, K. (1998). The design of geosynthetic reinforced foundation”, In: Proceedings of ASCE’s 1998 Annual Convention & Exposition, ASCE Geotechnical Special Publication, 76, 1-18. - Sharma, R., Chen, Q., Abu-Farsakh, M. and Yoon, S. (2009). Analytical modelling of geogrid reinforced soil foundation, Geotextile and Geomembranes, 27, 63-72. - Chen, Q., Abu-Farsakh, M., Sharma, R. and Zhang, X. (2007). Laboratory investigation of behavior of foundation on geosynthetic-reinforced clayey soil, Transportation Research Record: Journal of the Transportation Board 2004, 28-38. - Abu-Farsakh, M., Chen, Q., Yoon, S. (2008), Use of Reinforced Soil Foundation (RSF) to Support Shallow Foundation, Final Report. Louisiana Transportation Research, Center (LTRC), Louisiana Department of Transportation and Development, (LADOTD), Baton Rouge, LA, Report No. FHWA/LA.07/424, 195.